With the 17th Annual Lean Construction Institute Congress wrapping up last week in Boston, we’ve had Lean on our minds. 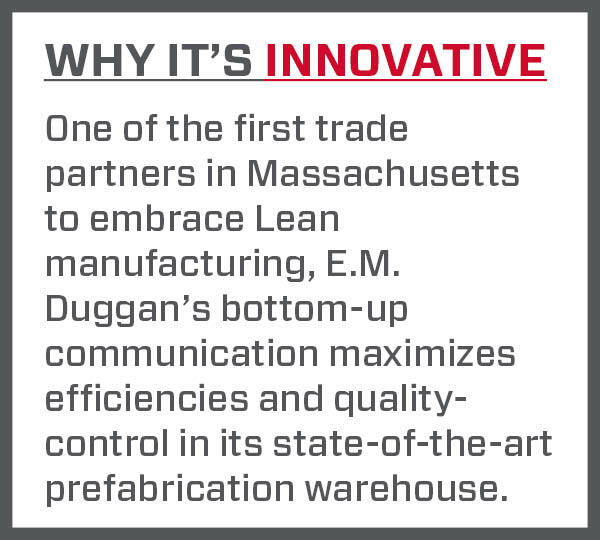 The following post highlights how Lean was successfully implemented at E.M. Duggan’s prefabrication warehouse in Canton, Mass. Working for one of the oldest family-run plumbing contractors in the country in the early 1980s, Mike Eakins was brought up in the industry the old school way. Eakins and his E.M. Duggan colleagues did a lot of housing jobs where equipment and materials were stored in trailers on the jobsite and the last thing loaded into the trailer at the end of the day had to be the first thing unloaded the next morning. Back then, many plumbing systems were assembled on the site before being installed. But when the recession hit in 2007, Duggan saw the downturn as an opportunity to hunker down and invest inward. They reinvested $10 to $12 million into the company, implementing new personnel, facilities and machinery. But one of the most significant shifts for the company was their investment in principles of efficiency known as Lean — or the systematic method for eliminating waste in a production line. But while the leadership fully adopted Lean, some of the more seasoned employees such as Eakins were slow to embrace these new strategies. “To be honest when I first saw it I said, ‘You’re wasting time, just get out there and work,’” Eakins recalled. Today Duggan uses the most cutting edge technologies and manufacturing principles at their state-of-the-art 60,000-square-foot manufacturing warehouse in Canton, Mass. They provide top-quality prefabricated plumbing, HVAC and fire protection systems to large-scale commercial, industrial and multi-family residential buildings in Massachusetts and beyond. Duggan’s employees manufacture, test and package piping systems at a steady pace, all from rows of freshly painted forest green workbenches that are clean enough to eat off. The workers connect pipes and fittings together in the climate-controlled warehouse so the assembled units can be shrink wrapped and stored the way they will be delivered and installed on the jobsites. Every item is stamped with a QR code for tracking and distribution, and the warehouse itself is organized by job and workflow to optimize efficiency. Trucks are loaded twice daily so prefabs can be delivered to construction sites across New England. While advancements in prefabrication techniques allow Duggan’s employees to work in a clean, safe and productive environment today, it wasn’t that long ago that they used nothing but their backbone to complete tedious tasks such as pipe cutting. And they used to do some of those tasks on the jobsite, usually on their knees instead of at a workbench. They not only had to contend with the elements but with other trade partners getting in their way. Eakins said Duggan’s employees are now “working like gentlemen” compared to how they used to. He also said the last generation of leadership at Duggan, including Ed Duggan II and Jim Murray, were prefabrication pioneers 50 to 60 years ago. But there was nothing Lean about how they did prefab in those early days. “When I was running the prefab shop I ran it like a factory,” Eakins said. “What we used to do was one guy would cut a pipe, one guy would solder it and one guy would put it together. Now these kids they are putting the work out much better. It’s all tested. Eakins originally thought that Lean involved too much upfront work to make it efficient. But after he witnessed such efficiencies bare fruit through the years, he started to come around on Lean. It’s hard to argue with the fact that creating such a Lean production line increased Duggan’s workflow capacity dramatically. They are now capable of handling $300 million in jobs simultaneously. Eakins was impressed that the buildings Duggan worked on kept getting bigger and bigger and were going up faster and faster. That, coupled with Duggan’s communication, efficiency and innovative spirit, ultimately convinced Eakins to get onboard with Lean. It’s one thing to do prefabrication in the cozy confines of a climate-controlled warehouse, but it’s another thing entirely to install those fixtures in the hustle and bustle of a construction site. That’s why Suffolk Construction Senior Superintendent James Fish had his doubts about Duggan’s approach. He visited their warehouse before using their famed prefabricated bathrooms on the Aloft Hotel in South Boston. “I’m looking at these big crates of stuff already prefabricated and it’s all sitting in a stack with labels and tags on it and I’m thinking ‘This is going to be a nightmare, I’m going to end up having to move these crates around everywhere,’” Fish recalled. Fish’s apprehension quickly faded when Duggan came out to his jobsite to mockup bathrooms to verify that their prefabs would fit. And they did, thanks to the virtual models and testing performed in advance. Fish was even more impressed when Duggan installed rough pieces for the bathrooms two days faster than he had scheduled. Fish also said they used three to four plumbers to do a job that would traditionally take five to seven workers. With the traditional approach, those workers would have to solder and weld all the piping together on the jobsite before installing it. Now everything is already built before it’s delivered to the site, so it just has to be hooked together when it arrives onsite. While prefabrication and early planning with partners have made significant impacts on Duggan’s successfully rebooted business model, in the end none of that matters without an innovative, open-minded and committed workforce who can actually pull it off. “Everyone’s opinion matters, down from the apprentice on the job unloading the truck all the way up to the president of the company,” Prefabrication Logistics Manager Joe Galvin said. Galvin said that communication leads to constant improvements on the ways they package and deliver units so they are able to install as efficiently as possible when they get to their destinations. They are constantly tinkering with everything from how carts fit on elevators at the jobsite to how to make the wheels on those carts run more smoothly. Former Lean cynics, like Mike Eakins, have been converted into Lean disciples because the results speak for themselves. And now that everyone at E.M. Duggan is onboard with Lean, there’s no holding back. Duggan is exploring expanding into new markets such as New York. This post was written by Justin Rice. If you have questions, Justin can be reached at jrice@suffolk.com or follow him on Twitter at @JustinAlanRice.